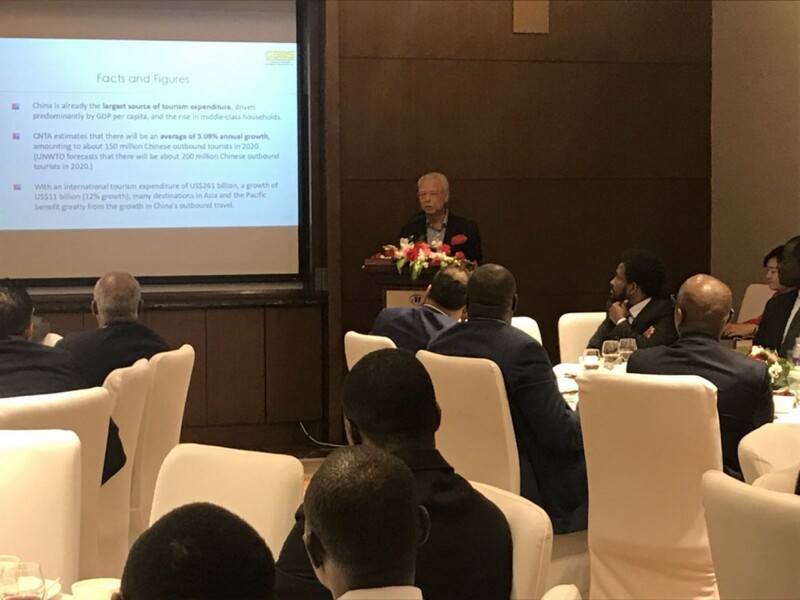 Some 35 senior officials of the African Union member embassies in Beijing were presented with details of the upcoming 2nd Beijing International Travel Mart (BITM) 2018 at a dinner reception hosted by the organisers, Conference & Exhibition Management Services (CEMS) at the Hilton Hotel Beijing on Wednesday, 18 April 2018. Mr Victor Sikonina, the Ambassador of Madagascar and Dean of the Diplomatic Corps in Beijing, was the Guest-Of-Honour, along with the Ambassadors of Benin, Cameroon, Mauritius and Namibia. More than 20 other African countries, including Rwanda, the current Chairman of the African Union, were represented by their Charge d’Affaires, Minister and Premier Counsellors and First Secretaries as well as officials of their respective National Tourist Organisations. Mr Edward Liu, Group Managing Director of CEMS and Honorary Consul General of Cote d’Ivoire in Singapore, explained that the main focus of BITM 2018 would be on the African countries as many of their Heads of States and Governments are expected to be attending the upcoming Forum on China Africa Cooperation (FOCAC) being hosted by the Chinese Government in the first week of September. Mr Liu is confident that more than 10 African countries would be taking part in BITM 2018, taking up some 300 – 500 square metres of exhibit space. At the dinner reception, the Moroccan Government Tourist Office announced that it would be a Partner Country for BITM 2018. Other National Tourism Organisations such as Rwanda, Sudan, and Tanzania have also expressed their interest in participation. According to Mr. Liu, “The 2nd African Dialogue will be back for a second edition as it was well received last year.” The inaugural African Dialogue held last year featured five panelists from different African Embassies, and National Tourist Organisations in Beijing. They discussed the relevance of ‘The Emerging African Tourism Frontiers’. The embassies were the Republic of Botswana; the Republic of Ghana; Moroccan Government Tourist Office; the Republic of Tanzania, and the Sudan Ministry of Tourism, Antiquities and Wildlife. The panel discussion was moderated by Mr Kwakye Donkor, Chief Executive – African Tourism Partners. CEMS Welcome African Union Dinner. Mr. Edward Liu presenting during the dinner. The 2nd Beijing International Travel Mart (BITM) 2018 will be held at the China International Exhibition Center (CIEC) from 5 to 7 September 2018. With a gross area of 4,400 square metres, BITM 2018 will feature over 200 international exhibitors from over 25 countries. In addition, BITM 2018 is expected to attract some 400 local buyers and is projected to attract 3,000 trade and public visitors from the MICE, OTAs, Travel Agents, Corporates and Trade Associations. Exhibitors could also look forward to customised business matchings through one-on-one meeting interaction technology to maximise the efficiency of their pre-scheduled appointments with the preferred local buyers. Therefore, exhibitors and buyers can expect to make fruitful discussions and collaborations in these meetings. For the record, CEMS had curated the Beijing International Travel Expo (BITE) series in Beijing, China in 2004 and had organised the event until 2016. Cumulatively, CEMS has a track record of 29 successful professional international tourism exhibitions such as BITE, CGITE, XSRITE, and CITE, with participants from across 80 countries over the last 15 years. For more information on the 2nd Beijing International Travel Mart (BITM), please visit www.BITMChina.com. Conference & Exhibition Management Services Pte Ltd (CEMS), a professional organiser for more than 40 years, ensures that its event will elevate the quality of business opportunities for all participants and visitors in the tourism industry. As the preferred China outbound travel platform, CEMS Tourism Series is set to take you to two of the top outbound generating markets within China for 2018 – Beijing and Chengdu. For more information, please visit www.cems.com.sg.